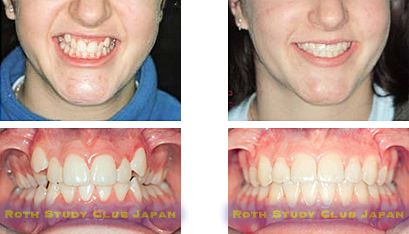 Tooth alignment is one aspect of orthodontic treatment. A more important objective is to achieve a functional occlusion with harmony between tooth fit and movement of the joints. In addition, it is also important to achieve esthetic improvement in facial profile, smile and dentition. The teeth should be aligned esthetically and functionally with a nice rhythmical flow from front to back. Shapely arch: Arch form greatly affects smile and function. It is this arch that supported the Ancient Roman masonry bridge. Coincident midlines: The midlines of the upper and lower arches should coincide. This is influenced by the health status of the TMJ, particularly the disc. There should be a nice flow from front to back. Teeth generally have gentle forward inclinations. 上An adequate overbite or vertical overlapping of the upper anterior teeth over the lower anterior teeth is very important. The upper incisal edges should be located outside of the lower incisal edges (horizontal overjet). Likewise, the upper posterior teeth cover the lower posterior teeth. All teeth should be in contact with adjacent teeth, which is important for periodontal disease prevention. Alignment from second molar to second molar is important for occlusal stability, function and TMD prevention. « Make sure that the second molars are in position. Dr. Roth stressed that it is extremely important to correctly position the upper and lower second molars for a functional occlusion. A lack of good second-molar alignment would defeat the purpose of orthodontic treatment, no matter how nicely the rest of the teeth are aligned. We, members of our study club, finish treatment when all teeth from second molar to second molar have been well aligned.